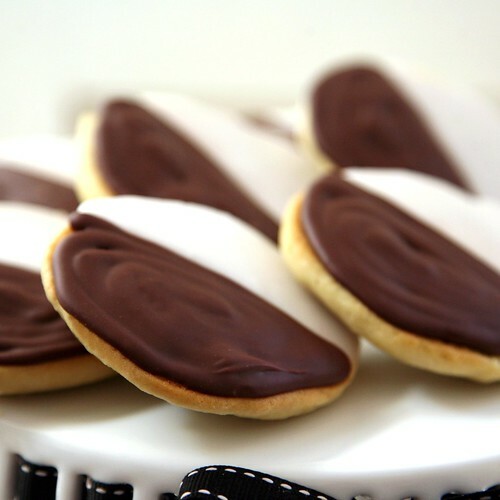 While I was in New York recently, I was reminded of a treat I don't ever see out here on the West Coast -- Black and White Cookies! So, when I got back home to my kitchen, that was one of the first things I had to make. They were really very close to the real thing, of course no one that tried them in San Francisco would have known the difference... Can I get a witness?? Stir together buttermilk and vanilla in a cup. Beat together butter and sugar in a large bowl with an electric mixer until pale and fluffy, about 3 minutes, then add egg, beating until combined well. Mix in flour mixture and buttermilk mixture alternately in batches at low speed (scraping down side of bowl occasionally), beginning and ending with flour mixture. Mix until smooth. Spoon 1/4 cups of batter about 2 inches apart onto a buttered large baking sheet. Bake in middle of oven until tops are puffed and pale golden, and cookies spring back when touched, 15 to 17 minutes. Transfer with a metal spatula to a rack and chill (to cool quickly), about 5 minutes. If you can stand the wait, cookies taste better if cooled without being chilled. Combine water and corn syrup; add to sugar and stir until well-mixed. Cook over low heat. Don't allow temperature of mixture to exceed 100°F. Remove from heat; pour out half of the icing into a bowl and set aside (this will be your White Icing). With the remaining icing in the pan, stir in melted chocolate. If mixture is too thick, you can add up to 2 tablespoons of water. 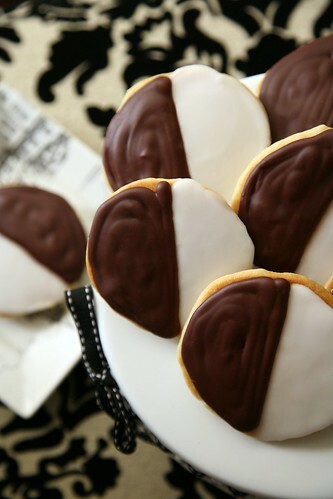 To Assemble: Cover cookie tops use a spatula or pipe icing on with a decorating bag. Let set.